Welcome to your Spirituality Immersion Yoga Retreat amidst the powerful Himalayan mountains and holy Ganges river of Rishikesh, India! Immerse yourself in a 7 day spiritual pilgrimage, set amidst the powerful peaks of the Himalayan Mountains. Rishikesh is the Yoga capital of the world and the gateway to the Holy Ganges. There truly is no better setting for a week of Ayurvedic healing. Our spiritual journey began the moment we did. As we get older and experience more of life, it’s not uncommon for some of us to become detached from our spirituality. In just 7 days, we will experience a deep emotional and physical healing, and support one another back onto our true spiritual path. Take a deep dive into the ancient practices of Ayurveda with lessons from an Ayurvedic doctor, taught within a traditional ashram. 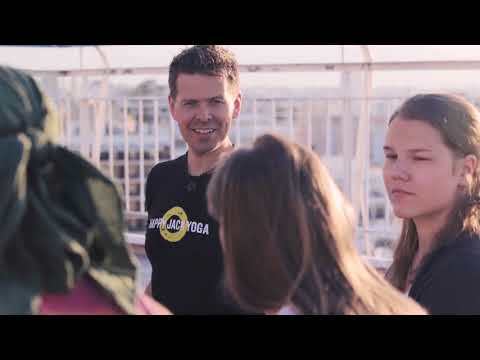 Discover a range of yoga practices, which, combined with the transformational Happy Jack Yoga system, will help you to tune into your mind and body, and understand the power that can be harnessed when you connect the two. Located in India’s spiritual playground, you’ll have numerous opportunities to explore different spiritual practices, or relax as the breeze drifts down the valley, setting temple bells ringing as it passes by. Meditate on the exquisite banks of the Ganges River, or wander through the lush, forested hills that frame the town. Leave a more empowered and enlightened version of yourself, back on your path and with the tools of heart, body, mind and spirit interconnected and ready to guide you. We are committed to your success. If after the first two days of this YTT you feel that you have not received value from this program, we will refund your full tuition amount. No questions asked. I explored India for the first time in 2012 and spent several months venturing from the northern Himalayas of Kashmir to the southern beaches of Kerala. During this journey, I found myself drawn to Rishikesh, the ‘Yoga Capital of the World.’ In 2015, I returned to Rishikesh to participate in an Advanced 300 Hour Yoga Teacher Training.I also invested a great deal of time studying and healing with a renowned Ayurvedic Doctor where I learned to heal and balance my mental and physical bodies specific to my personal Ayurvedic constitution. In 2016, I returned to Rishikesh to lead our Ayurveda & Yoga Retreat where even my mother joined us and loved it! I am delighted to announce we are facilitating this Yoga Retreat at the incredible ashram of my Ayurvedic Doctor! We will dive into the transformative and healing practices of Yoga and Ayurveda while living a truly authentic ashram lifestyle. This unique location lies in proximity to the Himalayan mountains and the Ganges River. This training has limited space and will sell out quickly. To reserve your spot, click the button below now!